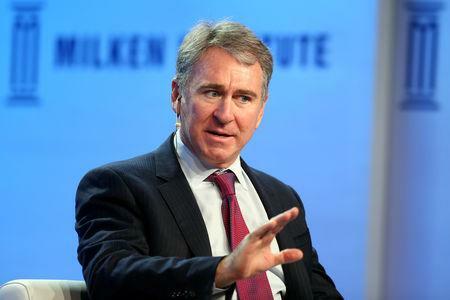 NEW YORK (Reuters) - Ken Griffin, the billionaire founder of hedge fund Citadel, has paid $238 million for a penthouse condominium overlooking Manhattan's Central Park, a spokesman for Griffin said on Wednesday, in a deal that sets a record for a U.S. home sale. Griffin has closed on the unit in the 79-story residential tower, which is under construction for an estimated cost of $1.4 billion at 220 Central Park South. The purchase follows on the heels of reports that Griffin bought a mansion in London within sight of Buckingham Palace for 95 million pounds ($124.2 million), among other recent deals. The price paid for the New York condo eclipses the prior record for a U.S. residential purchase, set by another hedge fund billionaire, Barry Rosenstein, for a home in East Hampton, on New York's Long Island in 2014. The Griffin purchase also shatters the record for the most expensive apartment sold in New York City, which was last set by computer company founder Michael Dell's purchase last year of a condo for $100.47 million, according to published reports. Vornado Realty Trust, a real estate investment trust, is building 220 Central Park South and expects it to generate $1 billion in after-tax cash flow and net income once all condo units are sold, a regulatory filing in October showed. The building, with 397,000 "salable" square feet, was designed by Robert A.M. Stern Architects. About 83 percent of the units are under sales contracts, with closings scheduled through 2020, according to Vornado, which declined to comment on Griffin's purchase. The Wall Street Journal first reported the purchase by Griffin, who first signed a contract for the condo in 2015. Griffin, who publisher Forbes estimates is worth $9.9 billion, in November paid $58.75 million for a four-level penthouse in Chicago, the most ever for a home in that city, according to media reports. Public records show Griffin has spent close to $250 million for land in Palm Beach, Florida, the Journal said. Vornado was represented by Deborah Kern of the Corcoran Group in the transaction, while Griffin was represented by Tal and Oren Alexander of the Alexander team at Douglas Elliman.